SCVHistory.com LW3452 | Film-Arts | Gary Lockwood (Hart High 1954) and Leslie Parrish, Early 1960s. 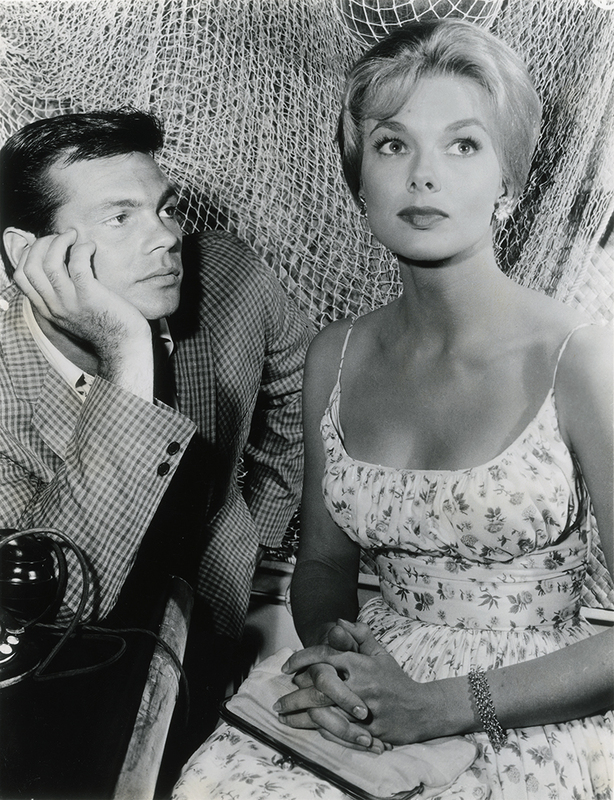 As if to embrace his growing reputation, Gary Lockwood (born John Gary Yurosek, Hart High Class of 1954) casts his glassic bedroom eyes on Leslie Parrish in this unaffiliated 8x10 publicity photo. Parrish (born Marjorie Hellen on the East Coast), a classical pianist-turned fashion model-turned television actress, was paired with Lockwood on screen twice: once in 1961 for an episode of TV's "Follow the Sun" (S.1 Ep.6: "Bushman's Holiday"), where Lockwood's character rescues her from a mob hitman); and again in a 1964 episode of the Lockwood vehicle, "The Lieutenant" (S.1 Ep.26: "Operation-Actress") where Parrish plays an actress who runs afoul of her studio's morals clause when she's caught during a raid on a wild party with young Marines. 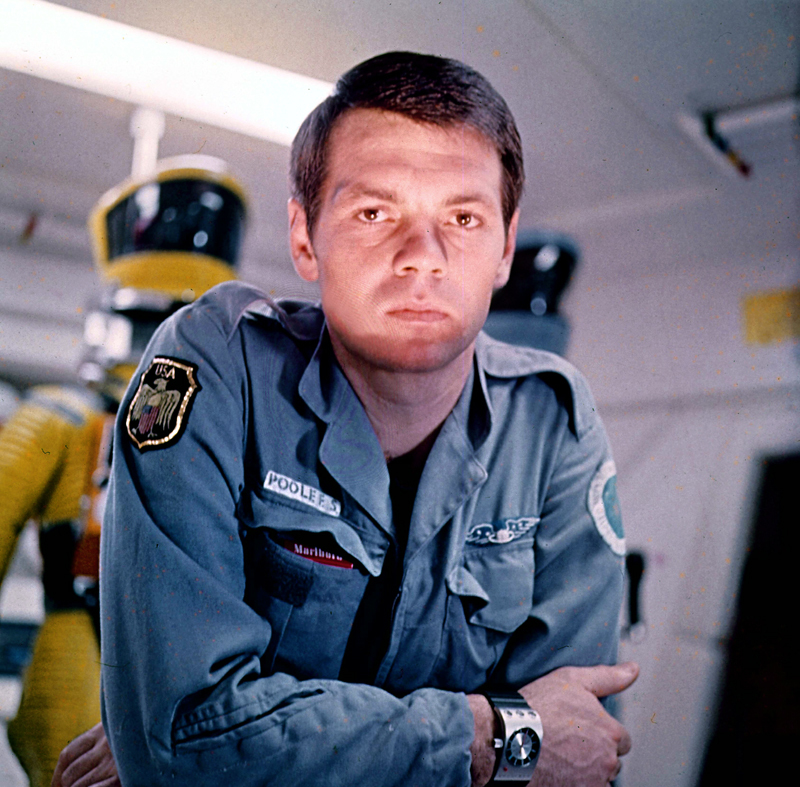 Gary Lockwood (John Gary Yurosek) as Lt. Cmdr. Gary Mitchell in the second "Star Trek" pilot, "Where No Man Has Gone Before" (1966). 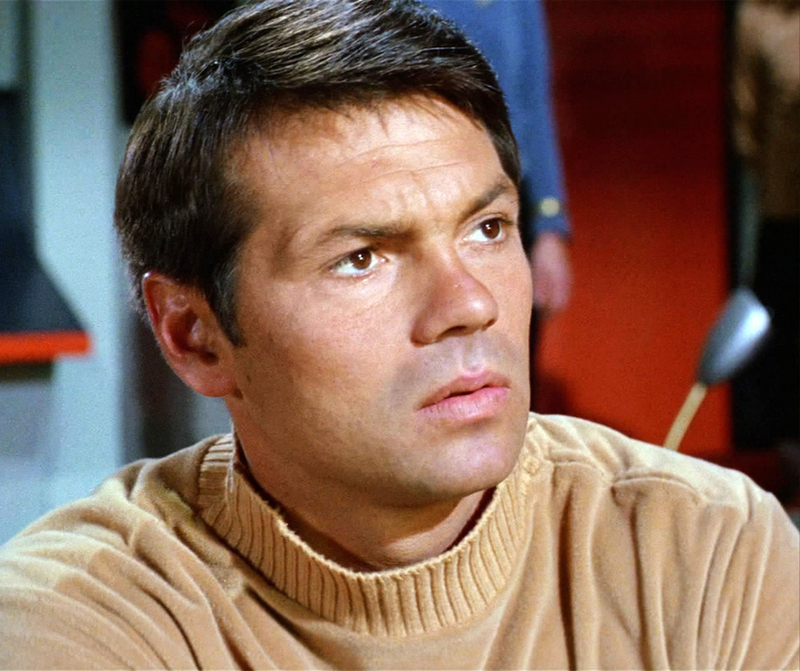 Actor Gary Lockwood (Hart High Class of 1954) was born John Gary Yurosek on Feb. 21, 1937, in Van Nuys, to John and Margaret Yurosek. Margaret was born in California; John's parents (Gary's paternal grandparents) emigrated from Poland, although John himself was born in Austria about 1911, according to the 1940 U.S. Census. By 1922, John and his parents (Gary's father and grandparents) had come to California, because that's when John's younger brother Mike Yurosek (Gary's uncle) was born in Burbank. Gary's dad was a contract farmer for canneries (per U.S. Census), and Mike joined him in the business in 1939. A decade later John (Gary's dad) and Mike (Gary's uncle) were growing carrots as well as turnips, rutabagas and parnisps in the Santa Clarita Valley, where Gary was enrolled in school. Uncle Mike went on to establish Bunny-Luv carrots in what became Valencia and later in Bakersfield, and Mike is credited with inventing the baby carrot (which isn't a variety, but rather a revolutionary packing method). After high school, Gary went to UCLA on a football scholarship, playing offensive and defensive tackle in 1955 and 1956. Finding work initially as a stuntman and as a stand-in for Anthony Perkins, he made his acting debut in the 1959 feature film "Warlock" starring Richard Widmark, Henry Fonda and Anthony Quinn. "Yurosek" being too hard to pronounce, Gary borrowed the middle name of film director Joshua Logan ("Mister Roberts," "South Pacific"), who is rumored to have gotten him his first job in the business. 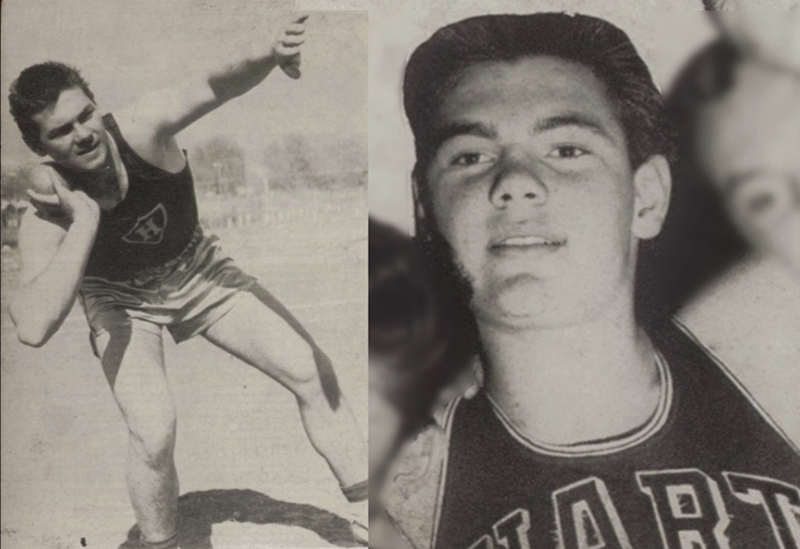 Hart sophomore Gary Yurosek (Lockwood), 1953. Locals remember Gary cruising the main drag in Newhall in his white Cadillac convertible with his actress girlfriend Tuesday Weld, with whom he appeared in a 1961 episode of the ABC-TV series, "Bus Stop." Gary soon vaulted to TV stardom. He landed the title role in Gene Roddenberry's 1963-64 series "The Lieutenant," and Roddenberry would use him again in 1965 in what would become one of Gary's most enduring roles (who knew?) — as Lt. Cmdr. Gary Mitchell in the second pilot for a speculative sci-fi series that was originally going to be called "Wagon Train to the Stars." Somebody thought to rename it "Star Trek." The episode featuring Gary, "Where No Man Has Gone Before," was filmed in July 1965 and broadcast Sept. 22, 1966. Apparently Stanley Kubrick liked what he saw, because shortly after filming wrapped on the "Star Trek" episode, Kubrick handed Gary his other most famous role — as Dr. Frank Poole in "2001: A Space Odyssey" (MGM 1968). Principal shooting started December 29, 1965, in England, and filming of actors was completed in September 1967. Gary (as Poole) and Keir Dullea (as Dr. David Bowman) star in the third act as the two astronauts en route to Jupiter on board the spacecraft Discovery One, which is controlled by the sentient computer HAL 9000. Meanwhile, Gary found time to marry actress Stefanie Powers on Aug. 27, 1966. They divorced Aug. 6, 1974. Gary then had a daughter with actress Denise DuBarry; actress Samantha Lockwood (nee Samantha Yurosek) was born April 28, 1982, in Los Angeles. Gary and Denise married May 31, 1982, and divorced in 1988. Lockwood as Dr. Frank Poole in "2001: A Space Odyssey" (MGM 1968). Gary Lockwood was born in Van Nuys, California. He attended the University of California at Los Angeles on a football scholarship. He began his career as a movie stuntman, and a stand-in for Anthony Perkins, prior to his acting debut in 1959 in an uncredited bit role in "Warlock" (1959). He also appeared as a police officer in "Perry Mason: The Case of the Romantic Rogue" (1959). Two series came early in his career, ABC's Hawaii-set "Follow the Sun" (1961), in 1961-1962, cast him in as an adventurous magazine writer in Honolulu. In 1961, he appeared as a rodeo cowboy in love with an 18-year-old singer, played by Tuesday Weld, in ABC's "Bus Stop: Cherie" (1961). He then starred with Jeff Bridges in "The Lloyd Bridges Show: My Daddy Can Lick Your Daddy" (1963). In 1964, he starred as a young U.S. Marine lieutenant in the NBC series, "The Lieutenant" (1963), which was produced by "Star Trek" (1966) creator, Gene Roddenberry, and "The Man from U.N.C.L.E." (1964) creator, Norman Felton. He then starred in another NBC television series called "Kraft Mystery Theater" (1959), opposite Sally Kellerman, with whom he would again appear in the second "Star Trek" (1966) pilot, "Star Trek: Where No Man Has Gone Before" (1966), as Lt. Cmdr. Gary Mitchell, and Kellerman as the ship's psychiatrist, Dr. Elizabeth Dehner, who both develop super powers. In 1966, he guest-starred in the episode, "The Legend of Jesse James: Reunion" (1966), of ABC's "The Legend of Jesse James" (1965), starring Christopher Jones. That same year, he appeared as Danny Hamil on the episode, "The Long, Hot Summer: Day of Thunder" (1966), of NBC's drama," The Long, Hot Summer" (1965), based loosely on the works of William Faulkner, as well as appearing as Jim Stark in the two-part episode "The Raid" of CBS's "Gunsmoke" (1955), with James Arness. He co-starred with Stefanie Powers (his wife at the time) in the episode, "Love, American Style: Love and the Doorknob/Love and the Phone Booth" (1969), of ABC's "Love, American Style" (1969). In 1968, he was cast as the co-star in director Stanley Kubrick's legendary sci-fi film, "2001: A Space Odyssey" (1968), starring as Dr. Frank Poole. In 1983, he made a guest-starring role as Alex Carmen in the "Hart to Hart" (1979) episode, "Hart to Hart: Emily by Hart" (1983), starring Robert Wagner, and (his now ex-wife) Stefanie Powers. Between 1959 and 2004, he had roles in some 40 theatrical and made-for-TV features and made almost eighty TV guest appearances, including several as a villain on CBS-TV's "Barnaby Jones" (1973), starring Buddy Ebsen. LW3452: 9600 dpi jpeg from original photograph purchased 2018 by Leon Worden.